Christmas Gifts | What did she do today? I love making gifts, in general, but I really love making gifts for my kids. I just finished the gifts and the wrapping…and I’m so excited to see the girls open them! I got this idea from Pinterest. 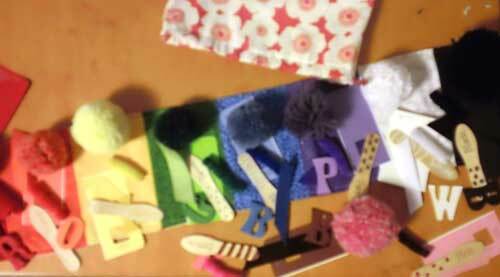 I made different items for matching, like the letter that begins each color, painted in that color, Handmade pompoms, Sticks with the color written out, and a design in that color on the handle. I think this will be fun to play with her, and may be something the girls can play together. Number fishing game, with two fishing poles. Each pole has a strong magnet on the end, and each fish had a washer in it’s nose. I figure this is another game that we can play with Istra, or she can play with her sister. She could fish for the single numbers, and we could do addition with Eowyn. I love making embroidered dolls. This is the first I’ve made for Istra, but I do like them for milestones, like Eowyn’s first Ballet recital, and going to see the nutcracker together. It’s super easy. Find an image you like, copy it onto your fabric with a pen made for such a purpose, or however you like to apply the image. Then embroider. Once complete, lay face down on backing fabric and just stitch around the outside edge of the image, leaving a hole somewhere to turn it right side out. You will hand stitch the hole closed. I often find images on Google, but this one is from a pattern I bought from Weewonderfuls, that I enlarged on my copier. I added a little something that I have not done before. A pocket on the back that houses a little chicken. Istra loves the animals, and I thought she’d like her doll to have a chicken, and now she has a place to store it, too! Eowyn is in her second year of ballet. She loves it, but does find the studio to be a little cool in the winter. I knit up this ballet sweater, and made the button for it. Now she’ll be cozy during her winter classes. Seek and find. I saw these in a store and thought they were cute, but that I could make them for next to nothing…turns out I could make them for actually nothing. I got a sample tube from the company I purchase all my packing supplies from. The rice was given to me for crafts from a friend who let the rice go stale, and the items inside were all found objects around my house…I splashed in some glitter I purchased for another project! I think this seems like a good car activity…we’ll see. Puppet Theater. Another inexpensive gift. A couple yards of fabric, 2 tension rods, and you have a doorway theater. We have the perfect door, right off the living room. They love to perform puppet shows, but the lack of a proper stage creates a little frustration from time to time. This should do just the thing. Well, the elf is done, and we are celebrating Christmas tomorrow, on Christmas Eve, so it’s time to go to bed. Merry Christmas! Mom is finally going to get her Christmas gift! The Apron looks great, I made a matching potholder, which I decided to try with bias tape and prefer my original way of making potholders, but it coordinates better with the bias tape. I decided that with the fact she’s been sewing and knitting a bit more, that I would encourage that, too. So she is also getting a little finger pin cushion and a knitting project back. The pin cushion is the same one I made my Holiday Traditions Swap partner, and it’s from the book, Pretty Little Pincushions. I made myself a project bag, as well. 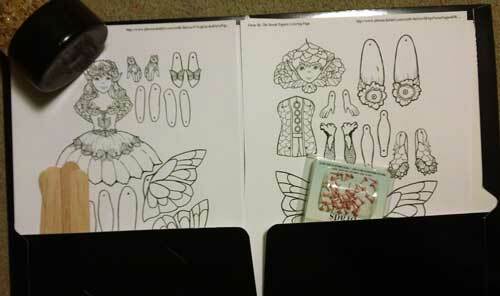 The project bags are from this absolutely adorable “Sewing Card” by Valori Wells. This has brilliant marketing. It’s an adorable little card, that has great photography, is priced low, $3.00. Could I have figured this out myself, after seeing the picture? Sure I could, but this card was just too cute to pass up. I tried. I succeeded twice, as it’s at the counter of my local fabric store, but this last time, the urge took over and I just bought it. I had been thinking about it since the last time I left it behind. Kind of silly, I know, but it was a fun little project, and I now have another project bag, which is good with the number of projects I’ve had on the needles at once lately. Granted, many folks run many more projects at once, but having 5 on the needles at one time, with only 2 small project bags, things are getting a bit too tangled! One of those knitting projects was completed today, however. 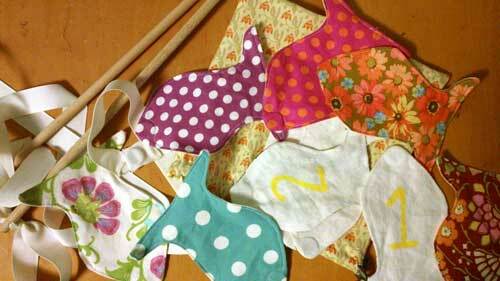 The little baby vest is a winner, and I’ll probably make at least 1 more before the little one arrives. It took less than 1 skein of yarn, there was a lot of breaking the yarn and reattaching, making for several ends to weave, but that is nothing compared to the last vest. This is all straight knitting, easy to follow, simple pattern. I dare say a beginner could handle this one. The writer is good about keeping you knowing where you are in the process. I really enjoyed the whole experience, which only took 24 hours really, as I was done today before I started yesterday. I told you that I gave up on the shawl for mom, that it just wasn’t working the way I wanted. Well, I decided to make her an apron instead. She gets dressed up for work, and owns her own business, so she’s often putting together dinner between appointments (in her good clothes). She has a half apron, but not a full one, and I thought the Lola from Sew Liberated blogger, Meg, would be a fun way to keep her clothes clean while she runs in to do a quick meal for her and dad. I started it before Christmas, ran out of my handmade bias tape, couldn’t find the bias tape maker (still haven’t, so I had to buy another), so I never finished. She was fine with an IOU for Christmas. She’s pretty laid back about such things, and she often find gifts a few days, even weeks, after the holiday and is giving them when they turn up. So, she understands. I finally got a new bias tape maker and made up the orange polka dot bias tape, so I was able to finish the apron today. I’m very pleased with how it turned out and I think she’s going to love it. I’m hoping to get a couple matching potholders made up tomorrow and then mom can have her Handmade Christmas gift. My pictures are pretty poor today, and I’m not sure if it’s me or the camera. The lighting is not looking right. 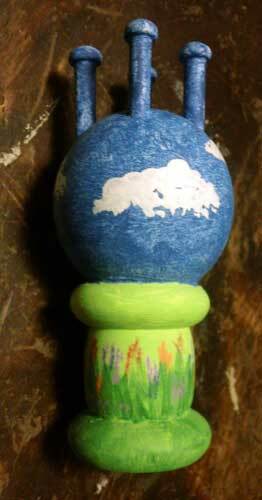 I need to fiddle with things tomorrow, but I have a couple more projects to share, so please forgive the lousy images. I’m made the last pair of Pj’s for mini. Mom is making a couple more and that will give us 6 pair. It’s pretty much time to retire the Hanna’s as she’s outgrown them. I toyed with buying more in the next size, but decided that flannel jammies really can’t be beat, both comfort and price so mom and I have been working on getting her a little night time wardrobe. I still need to put in the elastics, which I’ll do when she’s around to try them on, tomorrow, but the stitching is done. I knit up a couple more baby gifts. The cream will accompany the little vest for my cousin. The green will accompany the baby blanket for a friend. The hats have three little ferns that are topped by little fiddleheads or “Koru”. In New Zealand they are a sign of New Hope, which is a lovely sentiment for a new Life. These knit up FAST. They take very little yarn, and are fun. There is enough of a pattern to hold your interest, without being complicated. 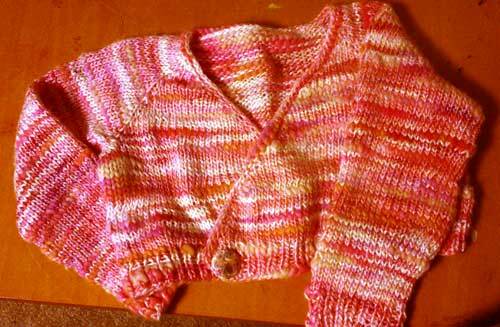 The designer is Just Jussi, and the pattern is available as a Ravelry Download. I didn’t see an option for the non-Ravelry folks, but if you are on, and knit, you need to go sign up. The site is very cool…but more about the hat… They are so cute with the little curls on the top. I think my little one needs one too…That list is mounting! I need to stop knitting gifts and start working on the New baby’s clothes if I’m even going to make a small dent in all the things I want to knit for her. See with Mini I knit mostly 6 months and larger because I was just learning and not doing a lot with the larger items, like sweaters until she was actually born. Being not sure how long a sweater would take I went larger figuring she’d grow into it. Also she was born in August so there wasn’t a huge need for cozy knits in that hot, muggy month. That strategy worked brilliantly, but since the next baby will be tiny during the cold months of March and April, I need to get some warm snuggly newborn things on the needles. I did make the cream hat last night after blogging, so I really only made 1 today, and I did stock up on meals yesterday, so I didn’t have to stop to make dinner. Add to that the fact the weather was beautiful today, so Husband and Mini went to the park, after the Library, out having fun most of the day, I really feel like I should have accomplished more. But that’s what I did today…along with a few more rows on the pink sleep sack. I’m sitting on the couch, eating Gram’s peanut butter fudge (thank you dad for grabbing some for me), knitting Husband’s sweater vest and enjoying the fully decked Christmas tree. My grandmother makes the BEST peanut butter fudge. I have had some excellent peanut butter fudge made by other folks, and I can enjoy it, but it just doesn’t compare to Gram’s. I missed Christmas at her house this year to weather and schedules, but dad “had my back”, and brought some home for me. I like her chocolate, but when there is peanut butter, it pales in comparison. I’m enjoying the Mangyle sweater vest. It’s just enough of a challenge, without being mind boggling. It’s coming out nicely and husband really likes it. The vest itself is very basic, and I might make one without the pattern on it at a later date…if husband likes wearing this one. I used Galway wool, and the cost was pretty reasonable…even with needing to get 2 skeins for the color work, that I won’t really use all of, it was 6 skeins of yarn, totaling about $35.00. Not bad. The tree now has all the ornaments from our Advent Journey. What a heart warming adventure that was. I think Mini really liked it and found it meaningful to the extent a 2 year old finds meaning. It’s nice to have them all done and ready for next year. I’m going to make bags for each day with numbers on them, so we can have those hanging across the top of the couch, under the window sill, or something, so the countdown is more visible. I wanted to do that this year too, but with the embroidery of the ornaments I didn’t have the time. My husband plans on picking songs for the candle days, too. Mini will be 3 next year so it will be nice to have it more interactive. I’m very pleased with the family time it created and the conversations is started even at her young age. For those who have asked. I did not use a pattern. I’m going to put together a PDF of all the images I used. Most are altered from free images online. I will also be putting together a list of all the verses to download. This is my second post of the day. So please be sure to go down one more for our Christmas Video Card! Our video Christmas Card, I hope you enjoy it, and that you are having a lovely day with loved ones! Christmas at mom and dad’s this morning. Life is good. A new stone bread pan, a dress from my favorite Etsy designer, and a new hoe for the garden! Yes, I’m that simple. Pictures when I get home, as tonight I’m at the in-laws. Mini received a fabulous wooden dollhouse. I love her crazy morning hair, and with the backlighting it’s even better! The downer for today was I didn’t get to go to Gram and Gramps for the Christmas Eve festivities. It was raining and I was worried if we waited until night time to go we’d risk encountering black ice. So we left home early. Very sad. I did instruct mom and dad to snag a couple pieces of Gram’s peanut butter fudge if she made it. Mom brought the Kansas corn I was going to make, so I’ll have to make some this weekend…it’s just the flavor of Christmas Eve to me. When I make it I’ll post the recipe. We did our last Advent time with mini and gave her our gifts. She asked for the socks to be put on, immediately, and is sleeping happily with her chicken right now, with promises of coloring in the morning. It was such a sweet, peaceful time to share as a family. 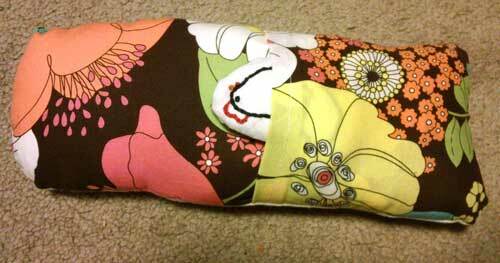 I’ve been wanting to make one of these for Mini since I saw the pattern on JC Handmade’s blog. I bought the pattern on Etsy. I modified it a bit, as I wanted to use a 4×6 pad instead of a 3×5 as I think 3×5 is just too small. I decided to make the pounch for holding papers more like a folder, as that seemed easier for little hands to put their drawings in that the pocket that the original pattern called for. But the pattern I bought was very easy to understand, well photographed, and since she gives you permission to sell the items you make it’s a good deal. Mini love orange so this fabric seemed just the thing. I filled it with the triangle crayons so if we use this in a restaurant we don’t have to worry about the crayons rolling off the table. I don’t know if I’ve mused on here about our gifts for Mini, but we try not to do much on Christmas for her. She has a very loving and generous family who shower her with gifts, so we opt to keep it low key, and just do things when she reaches new developmental levels throughout the year. However, I do love to make a couple special little things for her, and this year she will wake to a knit chicken, a new pair of socks and the crayon wallet. They will be in this little basket, as I still haven’t figured out what I want to do for stockings. Christmas starts tomorrow for us. We will go to my parents home in the morning for our “Christmas morning festivities”. We will be at my in-law’s on Christmas, so we are doing it up right, a day early, with my parents. Lots of family, food, and memories to be made, await the next couple days. I’ve thrown out that list, cut my losses and am preparing to sit down to a nice bowl of sausage pea soup, which has become my mealtime standby. It’s so easy to make, hearty and so darn yummy. I had to get carrots with the help of an ax tonight to make up this batch. Kind of funny…me out in my nightgown, wool coat, boots and a flashlight, whacking the frozen earth next to the carrots to dislodge the delicious orange delights. Oh, we got a blue green egg today! I’ve been getting some pinkish starter eggs, and figured they were from one of the Americana’s, I must have been correct. It was a treat to open the door this evening to such a fun colorful surprise. Since I tossed the list, I can now pull out whatever I want to leisurely, enjoyable, peacefully work on…I think the sweater vest for my husband will win, after a bit of tidying up. When the angels had returned to heaven, the shepherds said to each other, “Let’s go to Bethlehem! Let’s see this thing that has happened, which the Lord has told us about.” They hurried to the village and found Mary and Joseph. And there was the baby, lying in the manger. After seeing him, the shepherds told everyone what had happened and what the angel had said to them about this child. All who heard the shepherds’ story were astonished, but Mary kept all these things in her heart and thought about them often. The shepherds went back to their flocks, glorifying and praising God for all they had heard and seen. It was just as the angel had told them.